Mr Hu gave no details about the measures, which should mean emissions grow less quickly than the economy. The US, the world's other major emitter, said China's proposals were helpful but figures were needed. About 100 leaders are attending the talks, ahead of the Copenhagen summit which is due to approve a new treaty. UN Secretary General Ban Ki-moon said failure to agree a treaty in December would be "morally inexcusable". Negotiators for the Copenhagen summit are trying to agree on a replacement for the Kyoto Protocol to limit carbon emissions. Mr Ban called the meeting an attempt to inject momentum into the deadlocked climate talks. "Your decisions will have momentous consequences," he told the assembled leaders. "The fate of future generations, and the hopes and livelihoods of billions today, rest, literally, with you," he added. The Chinese president said his country would curb its carbon emissions per unit of Gross Domestic Product, a measure also known as carbon intensity, by a "notable margin" by 2020 from the 2005 level. However, the proposal is unlikely to mean an overall reduction in emissions, as China's economy is expected to continue to grow rapidly. A US official said that China's proposals were helpful but Beijing needed to provide figures. "It depends on what the number is," US President Barack Obama's climate change envoy Todd Stern said, quoted by Reuters news agency. But former US vice-president and environmental activist Al Gore praised China's "impressive leadership". "We've had ... indications that in the event there is dramatic progress in this negotiation, that China will be prepared to do even more," he said. Change from Beijing is partly a reaction to international criticism as China becomes the world's biggest polluter. The country's rapid economic growth has created demand for more energy and fuel. There is a growing need for Beijing to provide clear answers on what is being done to deal with the problem. Image-conscious Chinese officials want to be seen as co-operative internationally and accept that China must become part of the solution to major global issues such as the financial crisis and climate change. BBC environment reporter Matt McGrath says that much of the debate about tackling global warming revolves around the idea of absolute cuts in emissions of carbon dioxide - but developing countries like India and China feel that this emphasis is unfair. Richer countries, meanwhile, have had the benefits of centuries of fossil fuel use, and are now demanding that growing nations stop using them with no obvious alternatives in place, he says. 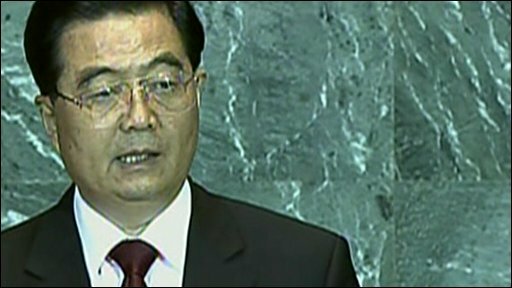 Mr Hu also pledged to "vigorously develop" renewable and nuclear energy. He restated China's position that developed nations needed to do more than developing nations to fight climate change because they were historically responsible for the problem. "Developed countries should fulfill the task of emission reduction set in the Kyoto Protocol, continue to undertake substantial mid-term quantified emission reduction targets and support developing countries in countering climate change," he said. According to the BBC's UN correspondent, Barbara Plett, discussions have stalled because rich nations are not pledging to cut enough carbon to take the world out of danger, while poorer countries are refusing to commit to binding caps, saying this would prevent them from developing their economies. China's role is crucial, because it is both an emerging economy and a big polluter, our correspondent says. Despite all its advances in green technology, China still gets 70% of its energy from coal - and as its economy increases, this means yet more growth in greenhouse gases, our correspondent says. There is also concern about the US. President Obama has recognised climate change as a pressing issue, unlike the previous administration, our UN correspondent says. He has already announced a target of returning to 1990 levels of greenhouse emissions by 2020, but critics say Washington is moving too slowly on legislation which does not go far enough. President Obama is currently dogged by domestic issues such as the economy and healthcare reforms, but his speech to the UN meeting will still be watched for signs he is willing to fulfil his pledge to take the lead in reaching a global carbon deal. A demonstration of political will by both China and the US will be important in breaking the deadlock in negotiations, correspondents say. 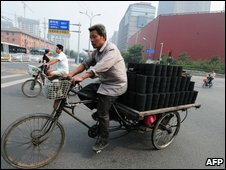 China and the US each account for about 20% of the world's greenhouse gas pollution from coal, natural gas and oil. The European Union is responsible for 14%, followed by Russia and India with 5% each.